There’s no way around it – spring cleaning takes work. But if you’ve been following our 31-day Spring Clean Challenge, you know that the most effective way to tackle a big job is to turn it into several smaller jobs. Well, here are eight more time-saving tips to help you along. Make a cleaning caddy You can find these handy organizing buckets at most hardware stores. 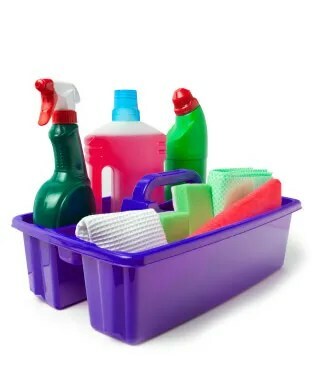 Fill the caddy with multipurpose cleaners, microfiber cloths and dish soap. That way, you’ll always have your basic cleaning tools on hand as you move about the house. Move your furniture and appliances just enough to clean around them Unless you’re steam cleaning the carpets, there’s no need to clear a room of all furniture before you start. When vacuuming, simply move those big items a little to the left or to the right, vacuum the area previously occupied by the furniture and then move it back into place. As an additional task: check the pads on the feet of your chairs and couches, and replace any that are dirty to prevent scratching your floors. Use all the tools in your cleaning armada Do you use the attachments that came your vacuum cleaner? You should. The upholstery brush attachment is perfect for cleaning cushions and drapes, while the crevice attachment can get into tight spots with ease. You can also use an extending rod to clean up high. 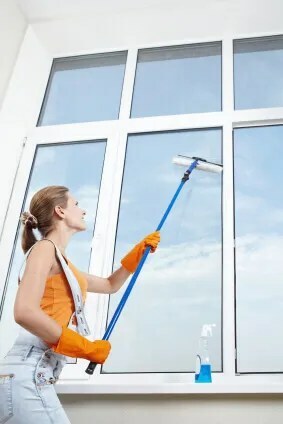 And when cleaning windows outside, save time (and a small fortune in paper towels) by using a squeegee with a pole attachment. Let water do your work Metal and plastic blinds can be removed from the window and cleaned outside. Scrub down the blinds with soapy water, then spray them clean with a garden hose. Lay the blinds flat on a towel to dry in the sun. Garbage cans, plastic furniture and toys can also be hosed down. Doing the work work outside will prevent you from accidentally bringing dirt and grime back in your house. Make a lost and found box Don’t waste time fretting about where to put that orphaned sock or how to neatly arrange your collection of extra shirt buttons. Instead, set aside a container for items that have no obvious home. Then you can resume your cleaning duties and worry about the little details later. Get rid of dust at the source A lot of the dust in your house gets recirculated by dirty air filters, vents and fan blades. Remove dust and dirt from ceiling fans and air-conditioner vents with a cloth and a vacuum with a soft nozzle attachment. Replace your air filters regularly, according to the manufacturer’s instructions.